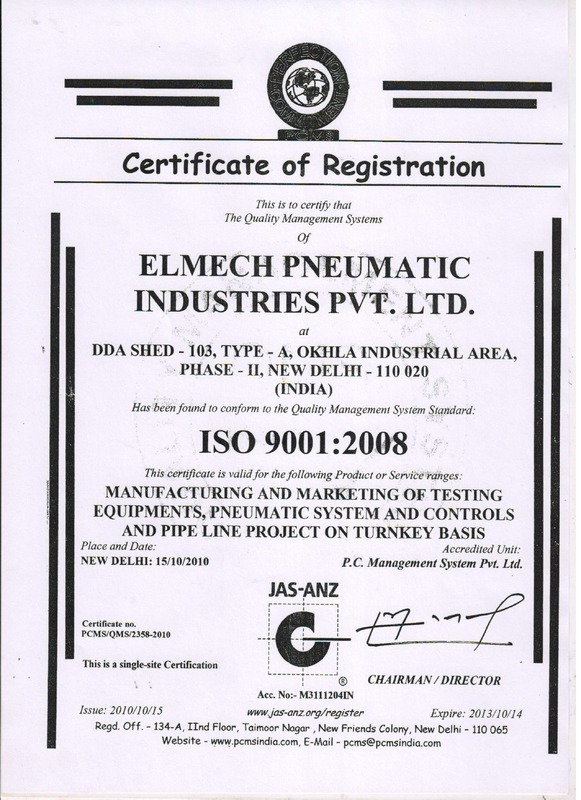 We, the Elmech Pneumatic Industries are among leading manufacturer for various pneumatic products such as flow index apparatus, melt flow index apparatus and carbon black test apparatus. Founded by two engineers Mr. K.K.B Pillai and Mrs. Suman Mehta, in the year 1983, whose technical expertise and dedicated hard work has helped us in fulfilling the specific needs and demands of our clients. Our manufacturing department is deployed with all the latest equipment to manufacture high performance and high quality products. The renowned status achieved by the organization is a result of 27 years of dedicated hard work, constant struggle and long patience. Our team of professionals are well trained to provide you with the best of products and services. Moreover, our wide spread network has helped us in making a stronghold in the market. We manufacture our Pneumatic products, with high performance and high strength, using the state-of-the-art engineering techniques, taking into account, the profound knowledge of our experts. Moreover, the raw materials that we use in manufacturing, are procured from reliable vendors to make sure that the resultant product is also of the optimum quality. We are one of the leading manufacturers of a vast range of pneumatic equipment like Testing Apparatus and Machines as well as Industrial Process Machinery. We are also prominent manufacturers of Projection Microscopes in India. We cater our products to various Indian clients as well as international clients which has earned us the membership of Export Promotion Council. Our dedicated hard work and an experience of around 3 decades has helped us in carving a niche in the market and gain a strong presence in the market our products are highly durable and cost efficient. The team at Elmech Pneumatic Industries comprises of highly skilled workforce that works with the utmost dedication and hard work, to provide you the best of goods and services to the clients. It is the result of the consistent efforts of our highly trained professionals for over 3 decades that we have created a niche for ourselves in the national as well as global market. Our team of quality analysts and testers conduct a detailed monitoring for the entire production process to keep maintain the utmost quality standards. We conduct testing on all of our products on our well defined quality parameters to avoid any flawed product's delivery. The sales and marketing team deployed with us conducts surveys of the current market conditions to serve the clients with the latest and new products. Our Research & Development team is also well equipped and trained to undertake a complete market and product research to provide optimum quality products to the clients. It is the result of such constant efforts by our entire team that our products are widely acclaimed and it has helped us to create a strong customer base and a huge network of dealers who help in smooth distribution of all our products, even to the remotest of places. Our work force is profoundly experienced and well versed in their respective domains. They constantly work hard to provide optimum products and services to our clients.